A Registration Confirmation and invoice will be emailed to you. Make Full General Payment of R25 000.00 (Excl. VAT) by relevant date per location (See payment Options Below). Only when proof of FULL PAYMENT has been received and confirmed, will the course information be emailed to you. Our online training is 45 hours, and is a combination of power points, videos, reading, handouts, and online tests. It is self-paced, but must be completed prior to attending the practicum portion of the course. Allow 1-2 months to complete your online pre-course work. Please allow for 1-2 months to complete your online pre-course work! Our live, practicum training is 10 days, conveniently divided into two sessions of 5 days each, Monday to Friday, 90 hours. This portion of the course is all hands-on labs and workshops, fun group activities and case studies to help you integrate your new knowledge. You must successfully complete all practicums by demonstrating mastery of each skill, and pass a final practicum test to receive your certification. Register for dates and locations that work best for you, then complete the online pre-course work prior to attending the practicum. Places will be offered to persons on the waiting list and deposits forfeited should balance of payment not be made by deadline. Deposits can be carried over for future courses, should you inform us 7 working days before final payment is due. Every participant receives Lymphoedema and Wound Care PRODUCTS sponsored by Medical Companies to use at the Course AND to take home in “Goodie Bags”. 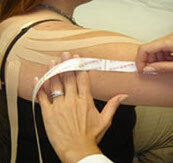 Lymphoedema Full Led Bandaging Kits, Lymphoedema Arm Bandaging Kits, Wound Care Dressings, Elastotaping etc. from a variety of Vendors. These generous donations are valued at more than R10 000 Retail pricing!! Allow yourself at least 1-2 months to complete the online pre-course work. It is VERY important to read through each part of the online Module BEFORE completing the test at the end of each section, as you cannot go back to read the information once you have started the test. This Module has to be completed and an average of 70% or more achieved in order to proceed with the Hands-On Module provided by Lymphatic Education Africa (LEA).